As fiduciaries, wealth management firms must be able to manage and track all investment recommendations to ensure they are in the best interest of their clients. InvestEdge enables firms to create customized investment recommendations for each client, implement those recommendations, and monitor investments to verify the decisions made to align with the client’s best interest. Consistency in the investment management process across your firm’s book of business is critical to firms serving as fiduciaries. 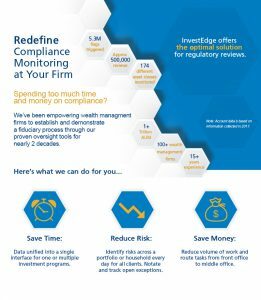 Redefine Compliance Monitoring at your firm today with InvestEdge’s optimal solution for regulatory reviews.